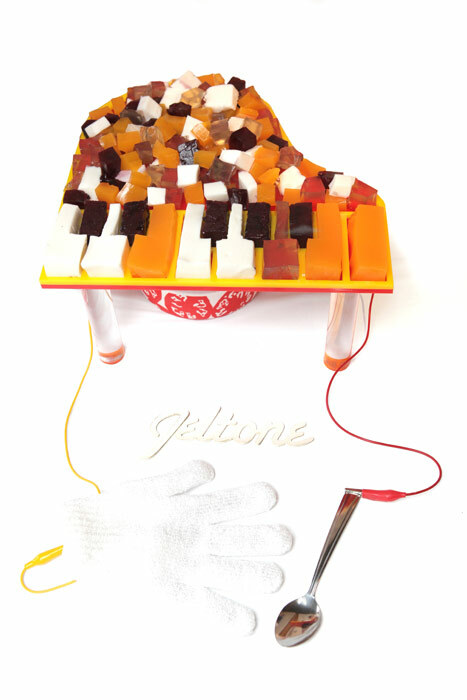 Astrida Valigorsky, Ranjit Bhatnagar, Mimi Hui, and Catarina Mota of Brooklyn-based hacker collective, NYC Resistor, formed a partially-edible working toy piano titled The Resistor JelTone. It uses (mainly) gelatin cubes and was created as an entry in the 2011 Jell-O Mold Competition where it tied for first place in the creativity division. Instructions have been posted on Thingiverse on how to create this quirky food piano at home. The same weekend, after the gelatin melted, a fruit version of the instrument was created for the Handmade Lounge at the 2011 Solid Sound Music Festival. As part of our experiments we realized that jello and fruit, which contain a lot of water, are conductive. Embedded in each jello/fruit key is a sterling silver pin (food safe) connected to a microcontroller underneath the piano’s base. Below the piano’s case is another sterling silver pin. With this setup, the JelTone can either be played with a metal utensil connected to the microcontroller, gloves enhanced with conductive thread, or bare hands by touching both a key and the piano’s case.